Riley McDaniel of Frontenac won his weight class at the Derby Panther Invitational. Frontenac High School senior wrestler Riley McDaniel is experiencing an outstanding senior season so far in 2018-2019. McDaniel, who wrestles at 138 pounds, is the number one ranked wrestler at his weight in the loaded Class 4A by the KWCA. He is currently 31-0 this season with a 123-24 record in his four year career. He took fourth last year and sixth as a sophomore in 2017. He has been involved with wrestling from a very young age and has went to tournaments every weekend since elementary school. McDaniel is also a type one diabetic and it’s something he battles every day with wrestling and making weight. If you think he’s tough on the mat, just think about how tough his battle with this has been everyday since junior high. He doesn’t let it get in his way to being one of the best wrestlers in all classes of Kansas for this season. McDaniel is a technique wrestler that uses his conditioning and quickness to his advantage. He may be known as a wrestler at Frontenac High School but he’s also benefitted other programs. He was once a state qualifier in cross country before coming over to football where he helped the Raiders as a defensive back the last two seasons. He has also qualified for state on a relay team (4x800) that holds the school record in track and field. He might be remembered best by the pass he picked off against Topeka-Hayden as a junior to help send the Raiders to state in the fall of 2017, the first appearance in a state football championship since 2000. The game was tied 21-to-21 before McDaniel picked off a pass in the redzone when Hayden was threatening to go 94 yards to the house for a score. It will be forever remembered as one of the biggest football plays in Frontenac High School history. The Raiders would go on to win the game 37-to-21 and it certainly changed all momentum. McDaniel will look to become the first ever Frontenac High School wrestler to win a state title. Former Sports in Kansas 4A-II Offensive Player of the Year in football, Brandon Mlekus, took second at state just two seasons ago. McDaniel isn’t the only Raider who has a shot either. In fact, the Raiders are quite loaded in 2018-2019. Currently ranked 4th in the KWCA as a team, the Raiders have one of the most loaded wrestling rooms in the state at 138-to-160 pounds, with four wrestlers ranked in all four of those weights. 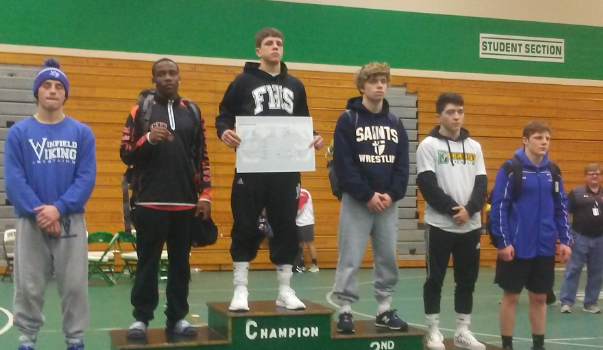 Will Jameson is also the top ranked wrestler in his weight class at 145 pounds. Brendan Ishimura is also ranked fourth at 152 pounds and Mason Jameson fourth at 160-pounds. “The competition in practice has really helped these kids out. They are all hard workers. It’s hard to find the quality of wrestlers in those four weight classes in the same room.” Frontenac head coach Keith Aikin said. A lot of the credit also needs to go to Akin and staff as Frontneac is not a known wrestling community until that of recently. The Raiders who have nearly doubled their enrollment in school size in the past 20 years have seen growth in this sport that Aikin started nine years ago. Mark Smith, the successful Frontenac High School football coach, has also told us numerous times how much the wrestling program that Aikin has built has helped benefit his football program, a program that took second in 4A-II in November of 2017. Wrestling teaches a mental toughness and gives you that one on one mentality where you’re 100% accountable for yourself to beat the man across from you. It creates competition and competitors. Its quite impressive to see a program that nobody knew anything about a few years ago that didn’t exist 10 years ago to now being ranked fourth in the loaded 4A classification. “We may be a small 4A school, but I don’t see it that way and I like being in 4A. Not saying the top guy from 4A can always beat the top 6A guy but 4A is likely the best classification as a whole. We want to compete with the best and 4A top to bottom may be the best competition in the state.” Aikin said. McDaniel and company will look to continue their success at they look to bring home some hardware this season. Regardless of what happens, this year’s team will be remembered for putting Frontenac wrestling on the statewide map. We caught up with the outstanding senior below. This feature is presented by Labette Bank. Proud to support coverage of wrestling in the state of Kansas with Sports in Kansas. Best of luck to all of the Raider teams this winter and spring! How did you get involved in wrestling? I started because my dad was a wrestler and got me into wrestling the first year that the kid's youth league started and Mason, Will and I went to tournaments every weekend together since elementary school. Do you guys have a shot to make a run this year as a team? What makes you such a force as a wrestler? My ability to push the pace of a match, my technique sets me apart from other wrestlers and my quickness on the mat is what makes me such a force. What’s the atmosphere like to wrestle for your school and town? The atmosphere has really grown since I've been in high school! Frontenac has a very good student base that shows strong support to our wrestlers and the community in Frontenac has really grown with the sport. For anyone that hasn’t seen one of your matches, why come to one? I honestly believe I put on a show for the crowd. I try and wrestle my way and when I do that its a really fast-paced match that is fun to watch. What is the mentality of being a wrestler? The mentality for every wrestler should be Embrace the Grind! Who are other key pieces? There is no better feeling than knowing all of you're hard work and effort has paid off. Do you play any other sports, tell us about that, what other positions do you play? How big was that INT against Hayden? I ran track my Freshman and Sophmore year and went to state my Sophmore year in the 4x8 and that team has our school record. I ran Cross country my Sophmore year as well and was a state qualifier. My Freshman, Junior, and senior year I was apart of the football team and my junior year I started at corner. My junior year was a year of ups and downs, I broke my thumb when we played Columbus and was fully healthy by the time we played Holton. That INT was something I will never forget, that game was the first time I saw a completely packed Frontenac stadium. After I gave up a touchdown in the first quarter and me being a competitor I wasn't just going to lay down. The INT was a big boost for our team and honestly, that pick wouldn't have been a touchdown without my teammates. What is it like to wrestle for your coach? It really is a grind! Our coach knows that conditioning will win tough matches. At practice, we will run before school or right after school. After that, we will then we will wrestle for a couple hours, and that consist of really though drilling and live wrestling. Its defiantly been a blessing having Coach Aikin to help perfect my wrestling! He truly is a coach that cares about you and will push you to achieve your goals. What's the success been like to witness Frontenac become a good wrestling program? Frontenac works hard in the offseason in the weight room for football and all the other sports. Our Wrestling team had practice two days a week after weights and we worked on technique and we also went to the True Blue camp that Oklahoma State puts on and its a really good camp to get better training advice and also the technique you learn there really helps. Honestly, right now I don't see myself wrestling at the next level just because of me being diabetic and it truly is a grind trying to manage that and trying to make weight. It just depends on if a good college offers me. My favorite thing about playing sports is the connection you get with you're teammates. Its a blessing having some of my lifelong friends to compete with and practice with every day. My role model all throughout my wrestling career has been Jordan Burroughs. The best place to eat in your town or the surrounding area? My favorite place is Bartos! I have been a type one diabetic since 7th grade.